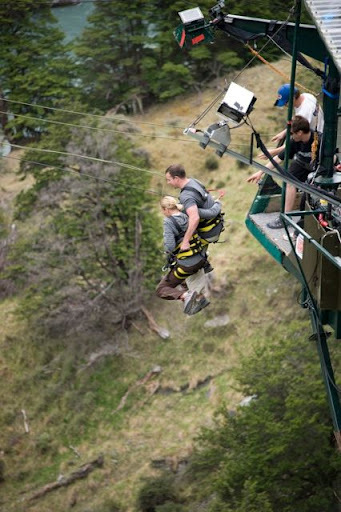 Queenstown is known as “The Adventure capital of the World.” The first commercial Bungee jump area was started in Queenstown, and since then they have been trying to figure out new ways for the adrenaline junkies to get high. In the winter Queenstown is also a ski bum town, which is exactly what it felt like when we were there. Mountains, Canyons, and lakes surround the area – but the town of Queenstown itself is even something of a beauty. The shot-over jet was a great time for a few reasons. First, The views in the canyon are spectacular. Second, it’s the type of activity that is thrilling (the driver comes within inches of the rocks and does 360 turns at high speeds) and yet you can do it any any age, and (unlike so many other nearby activities) your life does not flash before your eyes. They also have heated handlebars which is just plain luxurious for when you get wet – and you do. Queenstown is situated on Lake Wakatipo. According to our boat Captain, this lake is the second purest lake in the entire world – the first purest being one in Antarctica. The lake is so pure that they used to run the water directly from the lake into people’s homes in the area – now they just add fluride. We dipped a little jar into the water – and it really does taste great. Oh, we also caught to fish and then promptly had them prepared for lunch. When one finds themselves in a place known for extreme sports, how can they not give one a try. I personally never had jumping into a Canyon on my list I felt I needed to do before I die (and those who know me would not be at all shocked to know the list does exist) but “when in Rome.” The Canyon jump is the worlds highest cliff jump at 360ft. That’s long enough of a free-fall for the following: “Holy (expletive…Expletive)” long pause “Oh my god, Still Holy (expletive…Expletive)”. In short, it’s long enough for you to wonder what happened to the swing. Years off my life: roughly 3. Still highly recommend. I would also like to give a shout out to my uncle who did the jump as well (I believe based on video evidence he may have become a religious man for a few seconds). So ending on high note, we had to say good-bye to New Zealand. All I will say in summary was we should have spent easily twice as much time in this country! The thing that counts most in the pursuit of happiness is choosing the right traveling companion(s). Robin forwarded your post to me. I cannot wait to read more.